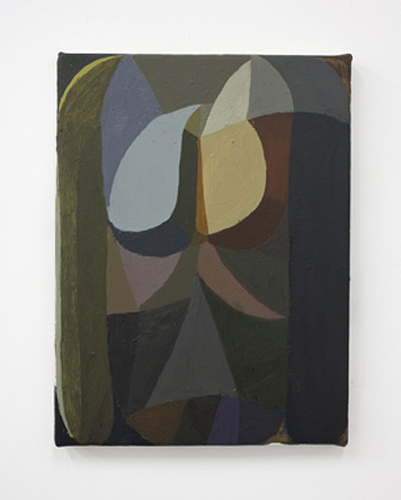 Sebastian Black, untitled, 2010, oil on canvas, 9 x 12”. From the “Puppy Paintings,” 2010. The cascading alliteration in the title (“Period Pieces, Puppies Paintings, Prototype, Placeholders”) of Sebastian Black’s latest show suggests that a comprehensive selection of his work will be on view, but in fact the show is quite spare. A single instance from Black’s series of “Puppy Paintings,” 2010, graces one wall, and on the floor are several angled mirrors—the kind that one sees in the upper corners of elevators—affixed to concrete. Another wall is covered in white plaster patches that disappear in direct daylight but are visible in shadows. The restrained atmosphere of the show demonstrates a measured decision to decline mere plenitude in favor of a rigorous, almost philosophical investigation. What unites Black’s show is a continuous inquiry into the nature of abstraction, and each piece on view investigates different possible meanings of that term. The “Puppy Paintings”—composed of abstract shapes that form what could be either heads of dogs or women’s torsos—play deftly at the edges of abstraction and figuration, and moreover reference early modernist appropriations of African masks. The show’s most accomplished piece—Untitled (Plaster Patches), 2012—seems to posit a subtle proximity between abstract painting’s picture plane and the random marked and stained walls that one encounters walking around New York. Rather than being coldly logical, Black’s investigations are rooted in the lived experience of the city. His thesis could be that abstraction is the language-game that allows art to appear in the midst of everyday experience.